Did you plant cloves of spicy-smelling garlic and now you’re wondering how to store garlic long term? Garlic is a wonderful addition to any garden, and it’s a wonderful sense of satisfaction harvest it – especially after you cure it and realize you won’t be needing to buy garlic from the grocery store anymore! The first year we planted garlic, we weren’t sure when to harvest it – it can be different for every zone and even ever microclimate. So we waited months – and came up with a GREAT harvest. 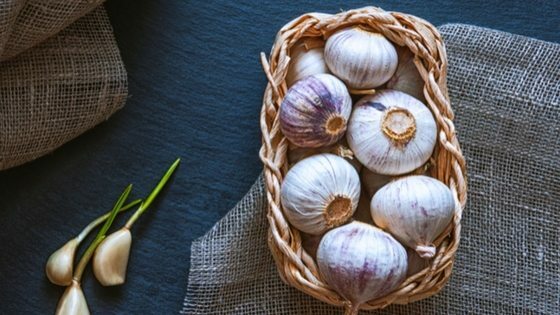 But then came the next step – how to store garlic long term without ruining it or losing it to bugs, dust, and other pests like mice. Should you remove the papery skins? What about bulbs that seem ok except for 1 or 2 spots? Could we store those, or did we need to use them right away? What happens if they’re rained on while curing them straight from the garden? You might have these same questions. If you want to store garlic long term, it’s fairly straight forward as long as you follow some simple rules. After you pull up all your garlic, you’ll want to let them cure for an hour or two in the sun – be sure to do this on a sunny day. 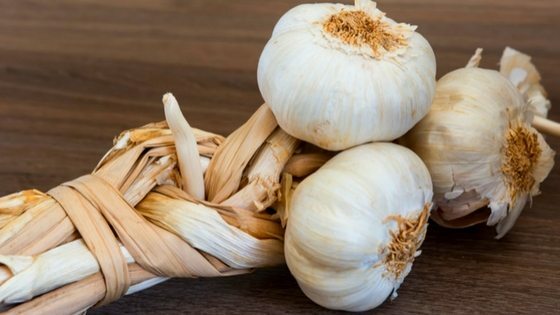 This initial cure helps them dry, prepares them, and is how to store garlic from the garden without ruining your hard-earned harvest. Next, you’ll want to examine the bulbs – take note of their condition. If any garlic bulbs have damage or seem soft, use them right away. They’re not good candidates to store long term. Once you’ve selected your garlic, you will want to cure them for an additional 2 weeks in a relatively cool environment – no warmer than 65 degrees. Higher temperatures can trigger mold or prompt your garlic to sprout. Humidity is another consideration when trying to store garlic long term – too high and it might cause your garlic to mold or rot, and too high will cause garlic cloves to shrivel and become useless. You will notice a lot of the dirt will fall away – this is a good thing. You can also brush the garlic very gently, although I’ve noticed this can damage them. If there’s excessive amounts of dirt, then you can try gently brushing it off, but if there’s just a little dirt, chances are it will fall off on its own. Don’t remove any of the papery skins – this will also damage the garlic, making it unsuitable to store long term. After the 2 weeks are up, you can then transfer them to mesh bags like these or braid them if they’re a soft-neck variety (hard necked garlic can’t be braided easily – keep these in a mesh bag). If braiding or storing in mesh bags isn’t your thing or you’re lacking the space, then you can dry your garlic. This process is simple and great because it produces a shelf-stable product that won’t sprout. Start by slicing peeled garlic into thin strips and then dehydrate them either in a commercial food dehydrator or by placing them on a cookie sheet and drying them in your oven at around 120 degrees for a few hours. Leave the door slightly open to allow for air circulation. Once dry, store garlic long term in an airtight container and use as needed. This hack has the added benefit of being great for colds. So if you have some spare cloves or just want to try something different, then preserve and store garlic long term in honey. Honey has antimicrobial properties and stored correctly, it’s nearly impossible for bacteria to grow. To preserve garlic in honey, peel the cloves, then drop them into a mason jar filled with honey. As long as the cloves remain submerged, they will keep for a long time. Pull them as needed, or drink the honey in tea whenever you’re sick – as the garlic stores, it will steep it’s immune boosting properties into the honey. Yum!